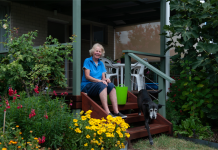 A PEACEFUL garden that’s both pretty and productive lies at the centre of Jane Vincent’s beef cattle farm in Sutton, though when she and her husband David moved in 32 years ago it was nothing more than a paddock. “There were a few stringy barks, but that’s it,” she says. 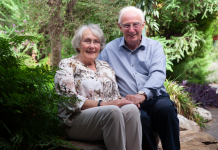 Jane and David’s 0.4-hectare garden in Sutton will be open to the public for the first time through Open Gardens Canberra on the weekend of October 15-16. The garden now includes many large deciduous trees, including desert ash, four wicking beds for veggies and three big orchards that yield serious amounts of fruit, says Jane. Year-round colour is a priority for Jane, too, with camellias in winter, bulbs in spring, roses for half the year and herbaceous perennials such as wallflowers. “The garden being productive is very important but I love that it looks pretty, too, with flowers for the house all year round,” she says. Favourite elements of the garden for keen gardener Jane include the cottage garden and the roses. “I love the scent and the variety, and being out in the garden is one of my main sources of enjoyment and relaxation,” she says. The couple preserve anything they can’t use, but aim to cook daily with the freshest ingredients from the garden. “We have several large composts in the garden, too, which is integral to the rest of the farm,” she says. “Gollion”, 93 Westmead Lane, Sutton, open 10am-4pm, on Saturday, October 15 and Sunday October 16. 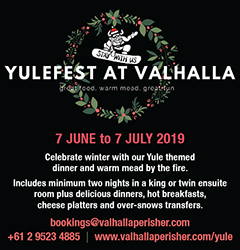 Admission $8; free to under-18s and Open Gardens Canberra members. 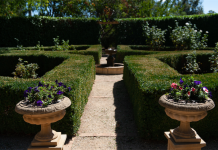 It costs $25 to join Open Gardens Canberra and gain free entry to all open gardens until August 31, 2017. More information at opengardenscanberra.org.au/join. DESCRIBED by the landscape-gardener owners as “experimental but inspired by the romance of Japan”, this zen space features a sacred garden of white stones and a Buddha statue, various “micro-views” and successfully combines natives and exotics with remnants of the old cottage-style, “granny” garden that grew there before. Open 10am-4pm, on Saturday, October 15 and Sunday, October 16. Admission $8; free to under-18s and Open Gardens Canberra members. Previous articleMacklin / When it’s all about jobs – theirs!